Today was the only full day of Worldcon 76 planning meeting, so we needed to make the most of it. Fortunately, I think we did. Although I "slept in" compared to Day Jobbe, it was still relatively early when I awoke this morning. Lisa sent me off to get breakfast so she could take a bath in peace. When I got back from breakfast, the first meeting session was already going. Lisa skipped the first meeting and joined us for the convention center tour later. We started with a general session in the Marriott going over the long agenda that we needed to cover today. Then it was over to the Convention Center next door for a tour of the facilities. 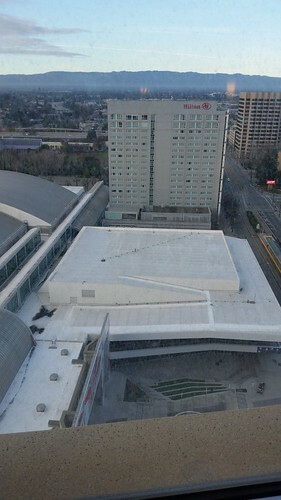 In this view from the 25th floor of the Marriott where I'm staying this weekend, you can see the Hilton (attached to the opposite end of the convention center from where the Marriott is), plus the white square building between the Marriott and Hilton. 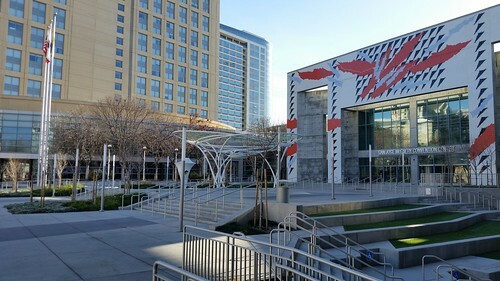 This is the new addition to the convention center (where the Library used to be) that wasn't there in 2002. 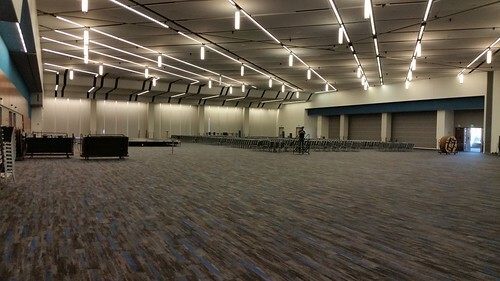 On the main convention level it houses the large ballroom that allows us to keep the big events under the same roof as most of the rest of the convention, instead of having to do them across the street like we did at ConJosé. This is what that large white building looks like inside. Come August, this room will contain for the Masquerade and the Hugo Awards Ceremony. 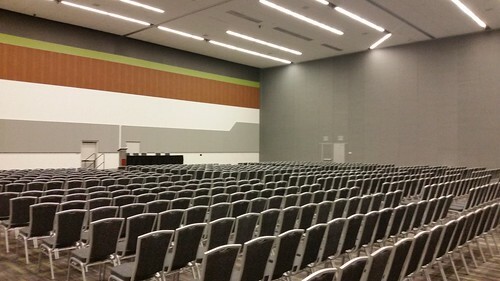 It's a little hard to visualize because none of the rooms were actually set the way we expect to use them at Worldcon 76, but this is the likely room for the WSFS Business Meeting. However, we'll only use half of this room (you can see the air-wall tracks in the ceiling), and it will be set "portrait" rather than "landscape." After touring around the convention center, it was lunchtime. Lisa and I joined Ron Oakes and Dave McCarty for lunch in one of the food-court-type places on First Street, an easy walk from the convention center. 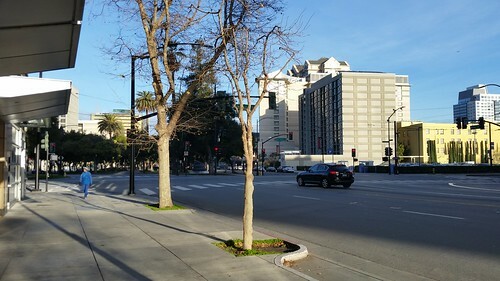 As Chair Kevin Roche put it, unlike back in 2002, downtown San Jose is no longer a "food desert," and there are many places near the convention center where you can get a good meal. Incidentally, when you step outside the Marriott, you can see the Fairmont Hotel (our largest hotel and the one where the parties will be held): it's the building with the pointy roof seen here. It's a long block away across the Plaza de Caesar Chavez. 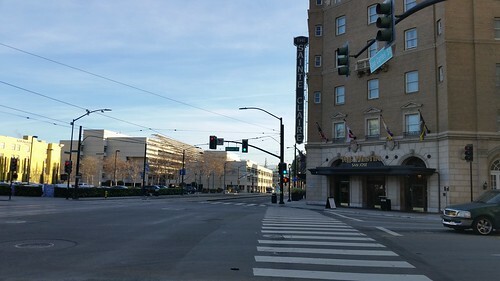 Across the street from the Marriott is the Westin Sainte Claire with the Sheraton Four Points in the distance. After lunch was the afternoon general session. The agenda was ambitious, but thanks to people resisting the urge to run off into the weeds, we actually finished slightly early, which gave all of us time for the many breakout sessions and smaller meetings that the general sessions spawned. I met with the budget director to confirm or correct things in the WSFS division, and went with Dave McCarty (Hugo Admin) to meet with Traditional Events (Hugo Ceremony) and other stakeholders to iron out some of the details in the interface between Admin and Ceremony. No show-stoppers, and everyone involved seems committed to doing the best Worldcon we possibly can. After a few hours of breakouts and side meetings, it was time for dinner. Lisa and I once again went with Dave and Ron, this time to San Pedro Square. The first place we checked looked good, but was all booked up, so we went down the street, and eventually ended up in the food-court type place at the far end. (This does allow everyone to get what they wanted.) We had to sit outside, and I'd left my jacket back in the car, but it was tolerable. Locals were shivering against the cold, but compared to Fernley, it was almost tropical. Later in the evening, many of us gathered in the "hospitality suite" (the Chair's suite), where socializing combined with conrunning. 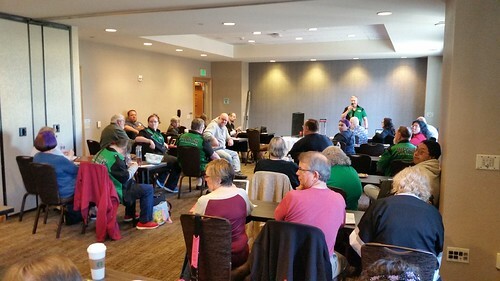 Worldcon is always a challenge, but we have a good group of people coming together here, and I feel better about Worldcon 76 after every one of these gatherings. As much as I love hanging out smoffing, we need to get some sleep now, because I have a 9 AM meeting where the divisions will report. After that, we'll have to check out because it's 300 miles home, and I need to allow enough time to stop in Sacramento to visit my sister, who I learned two days ago had been returned to the ICU but is once again back in the nursing care facility.